It's the volunteer's eternal question: How do you raise the money your organization needs in order to continue its important work? The answer is fundraising. Whether you're planning a bake sale, an elaborate charity ball, or anything in between, fundraiser extraordinaire Carolyn Farb can help you make your event a huge success. Liz Smith gave a good plug to our mutual friend Carolyn Farb's new book, The Fine Art of Fundraising: Carolyn Farb's Secrets to Success. As a premier fundraiser, Mme. Farb has plenty of secrets to share, and we'll bring more from her soon. Volunteer organizations are always in need of committed individuals and resourceful solutions. 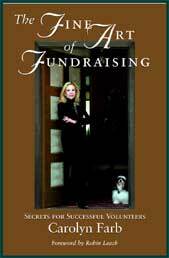 With so many nonprofit groups competing for the same few dollars, yours will benefit from the counsel of one of the top names in fundraising, Carolyn Farb.